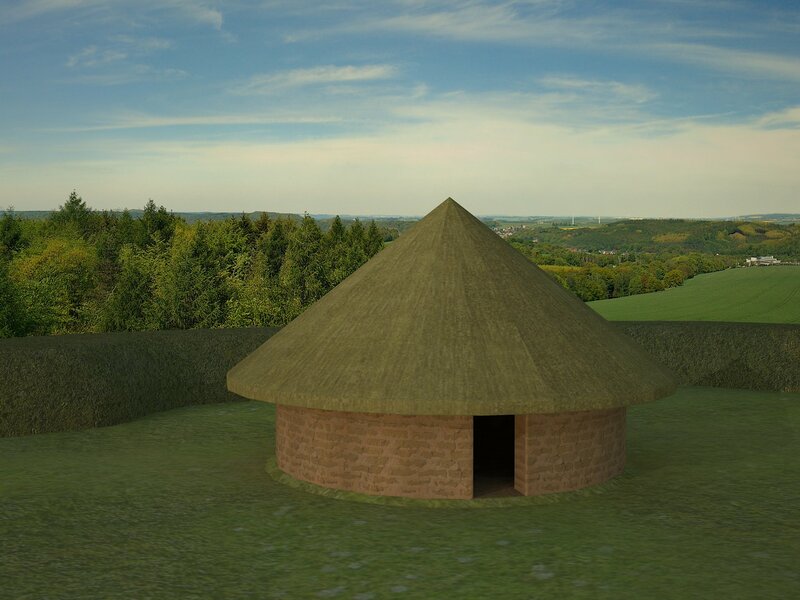 One of the projects I’ve been working on has been reconstructing a roundhouse we found at Caerau, Cardiff, using Sketchup to create the main frame, and V-Ray to render it as an image. 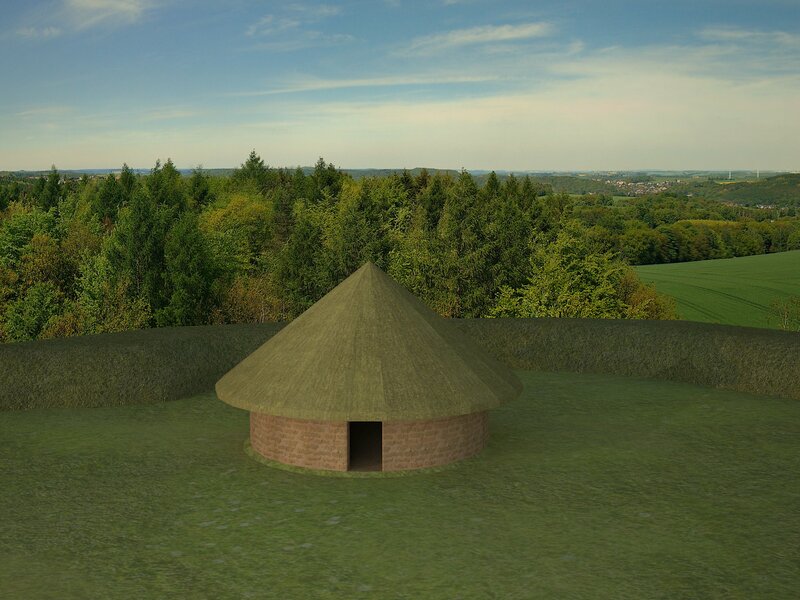 This will then be used to fade over some footage of the archaeological site, to show a transition between what we can see and what would have been present on site. 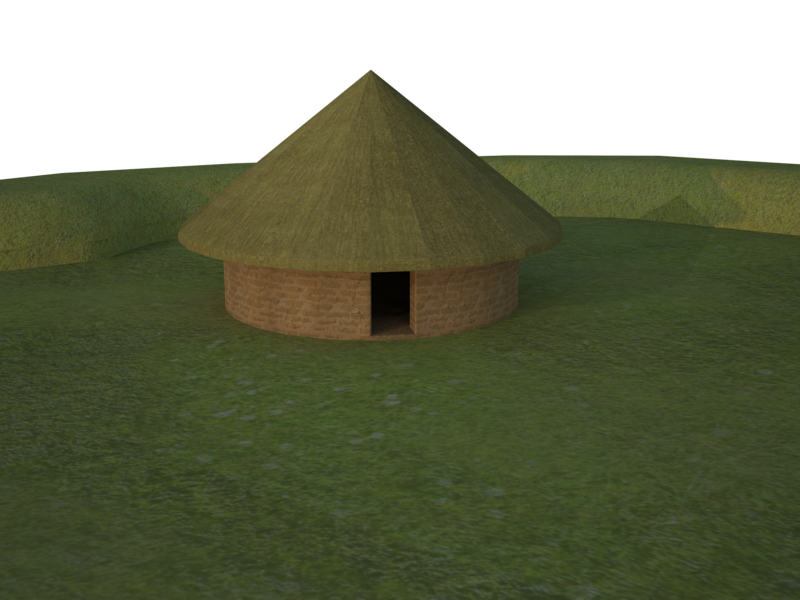 For this purpose I created a very basic roundhouse model, coupled with a fortification mound and a sheer drop behind it. All of this was based on the GIS data I had of the site, so it does represent what we actually found on site. The model itself is pretty simple, but it gave me a chance to play around with a few different elements of Google Sketchup, which will then be useful for more complex models. In particular I was looking at the application customised textures, the creation of backgrounds, and the use of rounded corners to create realistic mounds. Customised textures is one of the main points of 3D modelling, and is extremely useful to give the model a more realistic feel. The problem is that it is really hard for someone as artistically challenged as myself to create good textures, so I resorted to using a combination of pre-made ones instead. I used Photoshop to layer three different grass materials, and I rendered patches of each more opaque, to create many different coloured patches. This made the ground surface on the model much more realistic, as it’s not a repeating pattern any more, but a more complex and varied one, with different shades in different areas. I then realised that one of the elements that really made the model lack realism was the background. 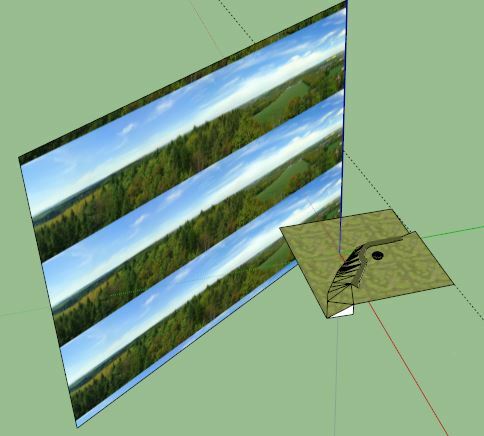 The Sketchup standard rendering mode is to create a background that looks like the sky, which with particular angles is fine, but that becomes a problem if we want to get specific images, like in this case. Therefore at first I decided to create a large cylinder shape around the entire model, and then paint it using a stock image of a panorama found online. This failed as the cylinder is actually made of many different faces, each of which started the texture from the origin point, thus making it repeat. Therefore I decided to use a flat surface instead, creating a sort of shield I could move around where needed, and that could be placed in the background of the rendered image much like a green screen in video editing. Finally, The mound itself looked extremely blocky, as Sketchup is not ideal when it comes to rounded surfaces. I tried using the Rounded Angle Plugin that I’ve mentioned before, and made the area of impact quite large. The result was exactly what I wanted, as it created a much more realistic mound, although it’s not ideal for the base, which can be a problem from some angles. Overall I think these three tips are really useful, and I shall be using them from now onwards to create better large scale models, and especially to simplify and improve the rendering process.